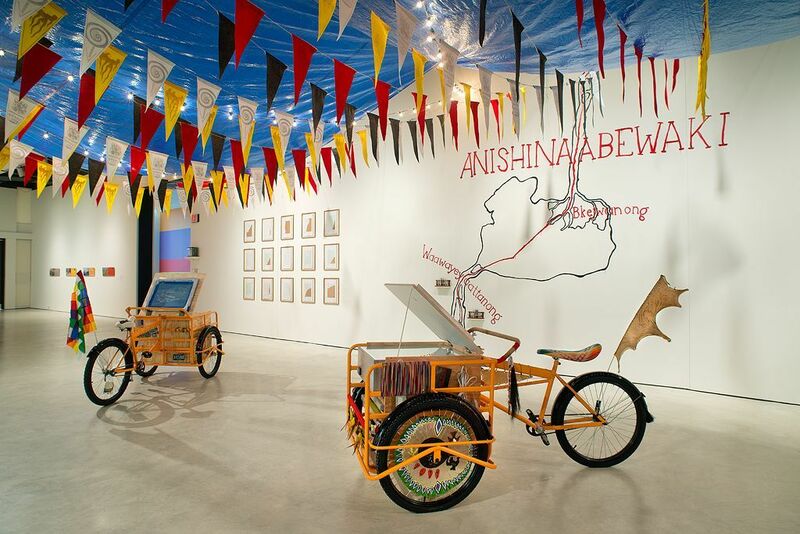 Throughout the exhibition the galleries will serve as a temporary community center featuring a reading room, a stage, and a printmaking studio filled with poetic banners and over a thousand wool pennants. Inspired by the Wobblies practice of incorporating art, song, poetry, and social activities into their organization, Miner and other artists, along with community groups, activists, and poets will use the DEPE Space community center to host a variety of free programs and engage the public in conversation about non-capitalist ways of being and imagining a better and more equitable world. Dylan Miner is Director of the American Indian Studies Program and Associate Professor in the Residential College in the Arts and Humanities at Michigan State University. Miner is also adjunct curator of Indigenous art at the MSU Museum and a founding member of the Justseeds artists collective. He holds a PhD from The University of New Mexico and has published approximately sixty journal articles, book chapters, critical essays, and encyclopedia entries.